About The Greek Warriors and where to see us next! Please use our contact page to email George and have The Greek Warriors at your event. See The Greek Warriors in 2013 at the following events! This is our schedule so far. Look for more festivals in the Tri-State area to be added! Come to one of New Jersey's best Greek Festivals. St. Anna GOC has a wonderful festival and will really let you know how great it is to be Greek for the day. Come taste great Greek food, enjoy Greek music and folk dancing, great children's activities, buy from vendors with many imported items, plus much more. St. Sophia Greek Orthodox Church - Greek Festival 2013 - 440 Whitehall Road, Albany, NY 12208 - Phone (518) 489-4442 - One of Albany's biggest attractions. This is the 42nd annual Greek Festival for St. Sophia and it has grown to be a major attraction for Albany. Over 25 thousand people visit the festival over the weekend which runs this year on May 17th, 18th and 19th. - The Greek Warriors will be there onFriday, May 17th thru Sunday, May 19th. St Sophia provides a giant circus size and heated tent to keep guests warm and dry in the event of rain or cold weather! This is a gem of a festival with numerous vendors, great traditional Greek food, games and rides for the kids, first class Greek music from a live band, and of course fabulous Greek dancers. Holy Trinity Greek Orthodox Church in Westfield, NJ , Greek Festival 2013 - The festival runs from Thursday May 30st thru Sunday June 2nd. The Greek Warriors will appear at the festival on Saturday, June 1st. and Sunday, June 2nd. We may add more dates to this festival, so please revisit to updates. This is a wonderful and large Greek festival filled with the essence of Greek culture and heritage. Sample the finest of Greek traditional dinners and deserts. See the beautiful church's interior with it's wonderous Icons and murals. See their fantastic Greek dancers with traditional Greek costumes. Shop on the festival grounds with over thirty vendors selling everything from jewelry, home items, handbags, artwork, children's items, and so much more! There are rides and arts and crafts for the kids as well. We are proud to visit this parish that is rich in spirit, faith, togetherness, and proud of their heritage. Members of The Greek Warriors in Phalanx formation. Pictured here is Mayor Bloomberg of NYC reviewing The Greek Warriors at one of our Greek festivals. We have also met and had a wonderful time talking with Archbisop Demetrios of The Greek Orthodox Church. He is a warm and wonderful Priest, and he loved our group. He looks forward to seeing us every year at the NYC parade. 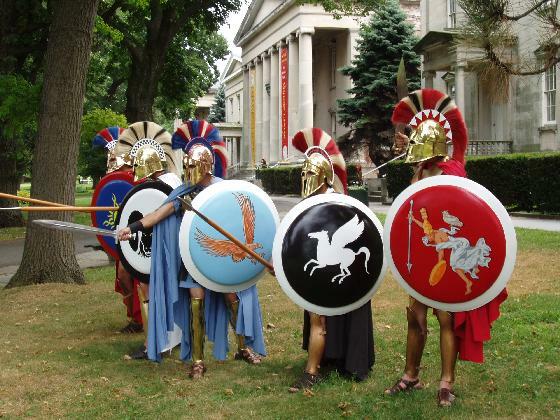 THE GREEK WARRIORS at the Snug Harbor Cultural Center in Staten Island, New York. The center has the largest collection of classical style buildings in such a close area. There are beautiful grounds, with fountians, statues, and botanical gardens!